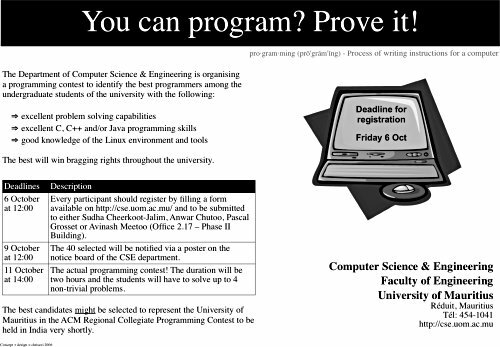 I’m happy to announce the CSE Programming Contest that I am organising together with my colleagues Sudha Cheerkoot-Jalim, Anwar Chutoo and Pascal Grosset. Please get the official announcement then fill in the registration form and return it to us by this Friday. The registration is open to any undergraduate student from the University of Mauritius (including non-CSE students) but we will have to choose (using some magic formula) 40 students to participate in the contest on the 11th of October 2006 at 14:00 as our biggest lab (the MCID Lab) can only accomodate that number of students. Please note that each of the 40 selected will have a Kubuntu Linux PC with ISO C/C++ and Java 5.0 compilers. Eclipse (with CDT) will also be installed but, of course, one can also use vi or emacs or kate (etc.) and the command line. lol… this gonna make our life harder ! no cigarette? no caffeine? no coke??? how abt giving the winner a laptop??? Hmm.. it’s been such a time since i wanted to test my leet C++ skillz ..winning or no winning, the best thing is that.. this is just GREAT. Yo thatz GR8 newz!! Herez sumfin nice happening @ uom! huh, gng 2 India is ok, bt wot abt the prizes? One notebook?? haha! Its good to hear the cse dept is organising smething superb… :) ..
will we have access to the net during the competition? or atleast access to reference manuals of java/c/c++?? i think ACM does provides this atleast..
You will have access to Sun’s Java 1.5 documentation (including the whole API) and also SGI’s STL doc. I’ve not decided yet for the Internet. By the way, 24 students have registered! well i thought the students would have been more enthusiastic..
anyways, i suppose many 1st and 2nd year students might not have applied since perhaps some of them think that solving the problems will b out of their reach..
i think such contest should b organised regularly, not only for the ACM programming Contest, and perhaps, if there was different levels, for eg for year 1 or year 2 or year 3 students, this wouldve attracted more students.. But then, with the limited logistics and money that we have at UoM, it might be tough to organise many such events instead of only one. Actually, there is something else that I’ve been thinking of lately. What about students programming collaboratively i.e. as in open source. For example, what if I give you a big program to write, so big (or complex or both) that it can only be done if ALL students participate. Imaging using SVN (Subversion) for versioning, something like Junit for automated testing and having to set up a Wiki (for example) to ease communication. Imaging using that new skill to actually start contributing to existing open source software. actually i’ve been thinking of smtg similar while i was doing my Software Engineering module last year. what could be better, than really working on a big project where we would be having the whole class working on one same projet and the class would be divided into small groups, where as in a real company, each group would be affected to developping some part of the program. still as u mentionned, ALL the students need to participate for it to b effective..and that would also help them see a bit more that wht they learn in class..
Only 24, Faculty of Engineering is so big. many students are in Year 3 both CSE and IS. MAy b about more than 75 in IS. I imagine what’s the problem about participating in the contest. Pas pou capave aprane par coeur ou parski pa pou ena copy paste. Or is the contest trop facile pou zote. In that case they are bane mari top. Thanks meet them in organisation CybercitÃ© plitard. Franc Franc. competition la pa ti facile. (Mr Meetoo ti dir sa). Mais bane seki ine participer in gagne ene bon lexperience. MazinÃ© bane seki content programming quine ronfler coume sa pendant 2 heure temps. Alor bane seki pa content sa ditous la alor qui zote penser. Pou moi personelement mo ti a content experience sa encore ene lote coup avant mo quite lâ€™uni. Mo espere qui Mr Meetoo pou organise sa pli souvent, esperÃ© li pa bliÃ©) Of course. Mo ti a prefere qui prepare bane zeleve pou cpave faire face sa bane type question la. Letemp jouÃ© mari boucou la dans. Mo ti a content trouve bane seki aprane par coeur la participe dan competition ene coup. Mo daccord mone blokÃ© mais lâ€™importance c de participer. En esperant trouve bane Computer Scientist qui aprane par coeur ene lote foi. question to avinash : did any student actually manage to finish more than 1 question in the alloted time? We’ll work on the evaluating your performance in the following days. And we are in the process of organising a prize-giving ceremony but nothing has been confirmed yet. Hmm.. am eager to see who managed to be in the top 3.
yeah ..btw did anyone managed to finish more than question1? I also failed.. i managed to work question one.. but i didn’t have time to output the results to a text file (forgot ios::app and instead was saying why isn’t ios::end working ) hahaha now i know what i need to learn. btw.. contest was SUPERB.. hope it’ll be held more and more. i attempted only one..and failed in so doing..
Aahh..great.. i’ll wait for the next contest then.. the next time we sure are gonna own the base.. what do you say csyke & sundeep :p ? I was freaked to see I missed it all..really to see 6 Oct..damn..duh..but that was a year ago..
i think it should not be harder than the international ACM Programming contest. So it should be tricky but not too difficult. In fact, we gave relatively simple problems to solve to the students.